The gracious and ornate lace pattern that adorns the top and bottom of this wedding invitation style, was taken from an old piece of hand made lace from a rural French antique shop. It overlays a delicate diamond pattern that is often found on brocade fabrics. The hand-crafted script letters have a casual, relaxed rhythm to their forms, and the accompanying text in italic letters allows you plenty of space for your information. This elegant and lovely style is available in a number of beautiful, rich and pastel colors. 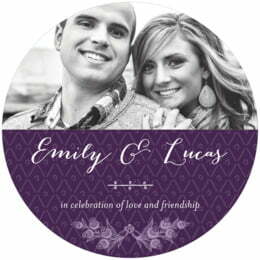 Customize your Lucky in Lace coasters today! Lucky in Lace coasters are made of extra-thick 58-point board. To give you an idea of how thick they are, a stack of a dozen coasters is about 3/4" tall. They are made of absorbent pulpboard to help protect your tabletop. The coaster surface has a smooth matte coating to provide beautiful, crisp printing. 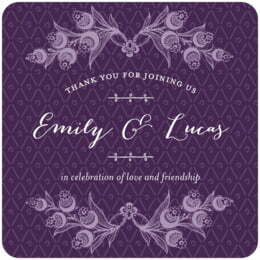 Each coaster is carefully die-cut in a letterpress, which gives the top edge its distinctive rounded shoulder. We use a digital 4-color, high-resolution press for fine detail and rich color. All of our personalized coasters are designed to match our labels, tags, and other products, so when you order multiple items, you get a matched set. On the back of each coaster, a small Evermine logo is debossed (pressed into the paper).